For a lady who has been sewing for five years I really don’t have much in the way of party dresses. In fact, in the lead up to Frocktails the only party options I had was my Tiki dress or my tulle skirt. Pretty rad stuff but those wardrobe stats aren’t great. So I did what any rad sewasaurus would do: rifled through my pattern stash, got some fancy fabric and sewed it like it’s hot. Boom! Say hello to my (very belated) Frocktails party frock! 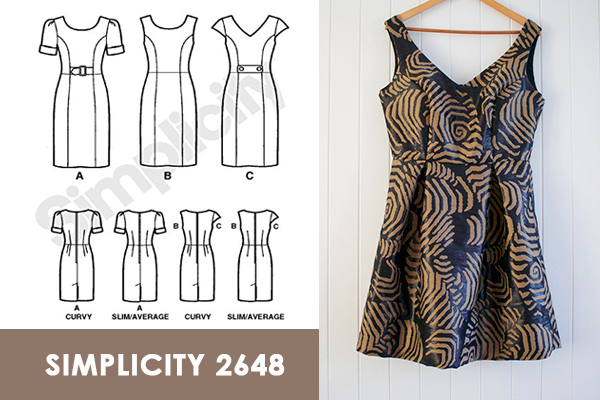 This is Simplicity 2648 and is a classic sheath dress in the Amazing Fit line. It has three different sleeve options, three different neckline options, four different cup size options and individual pattern pieces for slim, average and curvy fit. Basically, it is the Goldilocks of princess seam bodice frocks. And, as I discovered today, sadly out of print. Though in saying that, I snaffled this bad boy from Spotlight at the end of last year in a pattern sale so there are still a bunch floating around. The fabric is an acrylic/polyester/silk/nylon/wool blend from the fine folks at The Fabric Store as part of my February fabric allowance. The black pattern is rather eye catching as it has a wet look effect and catches the light. If you were feeling sassy you could even use the reverse – it was tempting but I wanted the black to be feature colour not the base. But real talk: it was a jerk to sew with. As to be expected with the different materials this sucker liked to fray. And not just a little. If I looked at it funny there were threads all over my floor. Ugh. So note to future self: overlock edges. Construction wise, this was pretty fun. 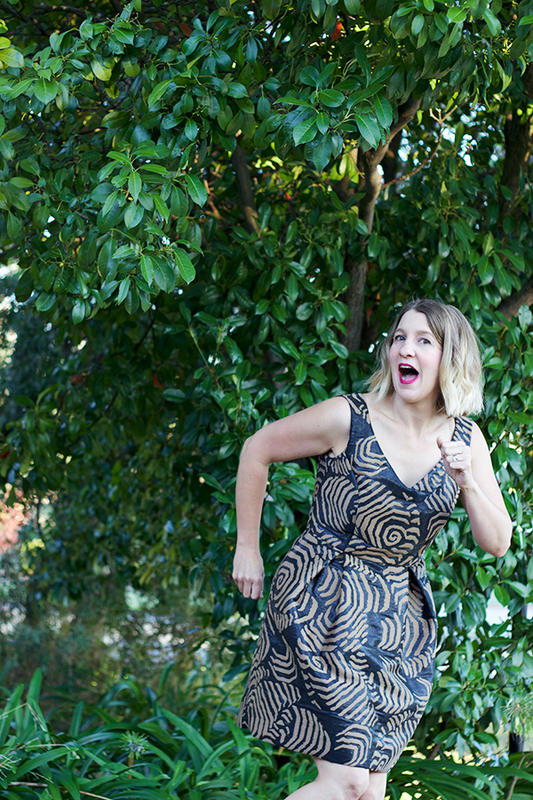 I should have read the instructions but was totally rushing to get this dress made for Sydney Frocktails and just jumped into the project – oops! As a result, I ended up messing with the bodice a fair bit. I decided the V neck was a bit too office wear so extended this by 2cm. And because I was on a roll I also redrew the armscye, added height under the bust to even the waist, scooped out the back neckline to make the back a bit more party and took the side seams significantly in. Boom! It has been far too long since I played around with a princess seam bodice and this one was a great place to work from! For the skirt, I decided I wanted something a little sassy. I initially tried a gathered skirt and the effect was HIDEOUS. It may have resembled Marie Antoinette. Except with less cake. And pastel colours. Seriously, when I walked out of the sewing room to check out the basted skirt in the mirror my husband did a double take with his mouth open in disbelief. And it truly was that horrid. And with two days to go to the event I did what every desperate sewing wizard would do and set my alarm for crazy o’clock the next morning to rip out the seams and try again. And can I say that before-work sewing is freaking awesome?! My brain was totally switched on and everything came together easily. I cut down my fabric to a better width (1:1.5 ratio) and then box pleated like it’s hot. My initial idea was to make one of those super cool midi length frocks but then time decided to get sassy. I’ve never worn a short cocktail dress before and this was the time to give it a go. And I have to say, even though I was a bit freaked out about all my leg on display, it was kind of fun. And cool. Because at Frocktails it was hot – I don’t mean from just all the rad sewasauruses being there… Summer in Sydney is full on! An awesome bodice to work from. Being able to trace a cup size that works from the start is such a relief. I love all the options that are available with this. It’s sewing for lazy rad people with limited time. The possibility for change. When I have finished tweaking the fit of this bodice, I’m looking forward to using it as a base for future frocks. Less time messing with bodices = more time to eat chips and dip. Win! Read the instructions. Past Amanda was in too much of a rush and she could have saved some time and effort by finding out about the various seam allowances that are on these pieces. Epic. Fail. Finalise the bodice fit. The fit under the bust still needs a little work and once that is done I’ll have a great base to work from! Overall, I really dig this frock. It was super comfy to wear and I felt just the right level of dressed up for Frocktails. And what a weekend away it was! I got to hang with some of my CBR Sewing Crew peeps as we road tripped down and stayed at a youth hostel (cheap, cheerful and close to the venue = win!). Then it was time to catch up with lots of Sydney sewing peeps, meet a bunch of awesome new friends and chat all the sewing. Sadly I didn’t get to break out my sweet dance moves… Maybe next time! Oh it’s a great fit, and I especially love the back scoop – so elegant! And what a blend! Dress owned, and to quote a very wise woman I know… Like. A. Boss. And not just any old Boss. But a sassy boss. Boom! Wowsers! Your dress is gorgeous! It reminds me a bit of the By Hand London Elizalex dress, and I love the fabric. Had to click on your other two dresses for a nosey, and they are amazing!! I’ve had a notion to make a strapless boned dress, so it was interesting to read your thoughts on making yours – which looks fabulous on you! If that dress were mine, I’d be wearing it to go to the supermarket!! And I love your tulle skirt, I have so much respect for you making this because me and tulle will never be friends. what a great dress – perfect cocktail hour look! I have recommended that pattern so many times and wish they hadn’t discontinued it. but as you say there are lots of copies floating around. Basically it is the ideal sheath dress pattern that you can change up and create a multitude of looks once you fit the bodice on yourself. I often make a muslin of just the bodice of a dress to work out the fit on that area. Wow! Amanda, you look beautiful. Hope you had fun at the dvdnt. Such an awesome dress, love the fabric and those pleats It looks so amazing on, this pattern is definitely a winner! Nailed it! .Another win for the sewing wizard! You totally won. THis is fabulous. My mother bought an Amazing Fit pattern. I rashly offered to make it up for her. So it’s very good to read of your success. This looks really good on you – good job with the alterations!